← 2 January 1863: “…the ladies were under a guard of Federal Soldiers haing spent the night in Jail and part of the time in a Criminals Cell!! Item description: Entry, dated 3 January 1863, from the diary of Taylor Beatty, Confederate officer of Thibodaux, Lafourche Parish, Louisiana. The chief figure in these papers is Taylor Beatty (born 1837), son of Charlotte Beatty (1810-1847). He was a Confederate veteran, lawyer, and judge, and spent most of his life in Thibodaux, Lafourche Parish, Louisiana. He married Fannie Pugh (fl. 1883-1917) and had four children: Kate (fl. 1880s), Charlton (born 1869), Charlotte (born 1883), and Taylor (fl. 1891-1917). He owned Dixie and Vivian Plantations. His mother, Charlotte Beatty, also lived in Thibodaux. She was the daughter of Walker Reid (born 1783), who moved to Kentucky in 1804 and settled in the town of Washington in Mason County. It appears that he moved to Kentucky from Virginia. Item citation: From the Taylor Beatty Papers #54, Southern Historical Collection, The Wilson Library, University of North Carolina at Chapel Hill. Ordered to move to the front to relieve from picket duty the 10th Miss. Capt. Kent in command – bad manner of campaigning, etc. Lt. Col. Farrar joined us on what we have called the Round Forest – and relieved the 10 Miss. – Skirmishing all day – and lost 10 or 15 men. Enemy sent in a flag of truce to ask for the body of a Kentucky Captain, as they said – in reality to see our position – their request was refused. We are now on the railroad – near the Nashville Pike. About 6 P.M. the enemy opened on us with 12 pieces of artillery and kept up the fire for about an hour. 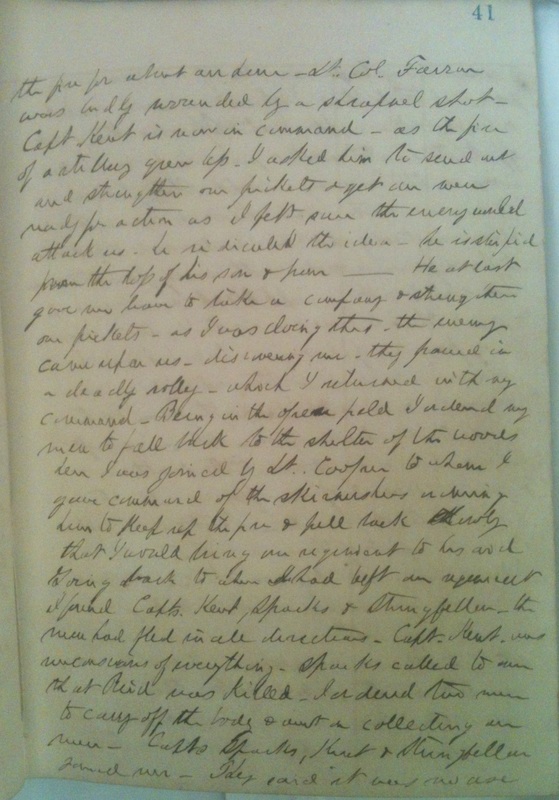 Lt. Col. Farrar was badly wounded by a shrapnel shot – Capt. Kent is now in command – as the fire of artillery grew less, I asked him to send out and strengthen our pickets and get our men ready for action as I felt sure the enemy would attack us. He ridiculed the idea – he is stupid from the loss of his son and heir. He at last gave us leave to take a company & strengthen our pickets – as I was doing that, the enemy came upon us – discovering me, they opened in a deadly volley – which I returned with my command. Being in the open field, I ordered my men to fall back to the shelter of the woods where I was joined by Lt. Cooper to whom I gave command of the skirmishers ordering him to keep up the fire and fall back slowly, that I would bring our regiment to his aid. Going back to where I had left our regiment, I found Capts. Kent, Sparks & Stringfeller – the men had fled in all directions. Capt. Kent was unconscious of everything. Sparks called to me that Reid was killed. I ordered two men to carry off the body and went of collecting our men. Capts. Sparks, Kent and Stringfeller found me. They said it was no use to remain any longer as all of our men were gone. I told them I should remain until ordered back. Capts. Kent and Sparks then went off to the earthworks from which we had come in the morning. Capt. Stringfeller remained with me. Several regiments had now come to our aid, and I endeavored to get them to push forward & drive the enemy from the woods but could not – Capt. West now came up and said that he would not take the command away from me of what men I had, but would serve under me. I then ordered my men forward & we recaptured the same position we had been driven from. We were soon after relieved and I went over to the earthworks and found several of our officers with the colors of the regiment. So it goes — is there to be a report of this or not — It has been raining all day & is still – the mud where we are is six inches deep. 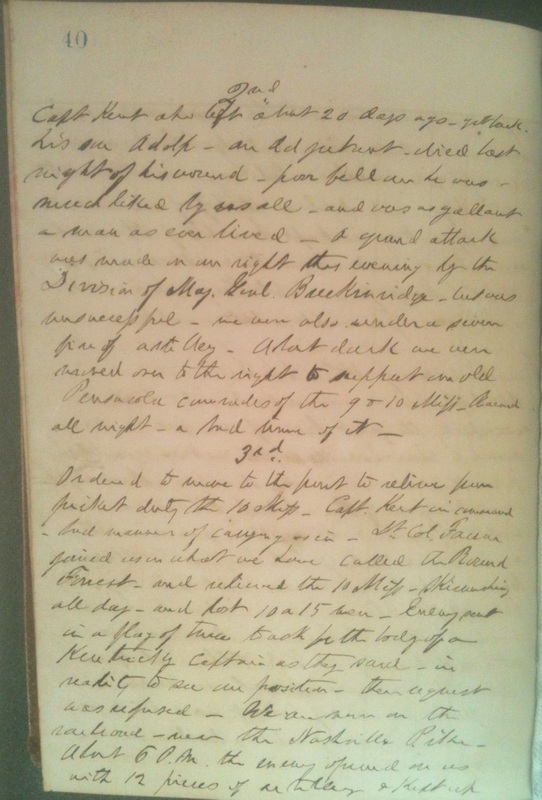 This entry was posted in Southern Historical Collection and tagged diaries, Lafourche Parish, Louisiana, Taylor Beatty, Thibodaux. Bookmark the permalink.